Maintenance is easy with innovative front-only maintenance access to the system. 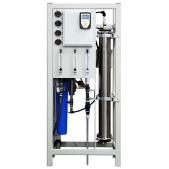 Quickly replace membranes and sediment filters without wrestling within tight spaces or working around other equipment. Complete systems with dechlorinator, duplex water softeners, and brine tank ensure the longest membrane life possible for the system. The industry-leading Vapor-logic® controller offers BAS network communications capability and delivers comprehensive system management. Alarms quickly inform the users of issues or changes for easy monitoring and corrective action. The Vapor-logic controller makes these RO systems the first interoperable systems available with BACnet® , Modbus®, and LonTalk®. Options: Skid mounting for pre-treatment products, atmospheric storage with UV treatment, single or duplex softeners, dechlorinators, and various capacities and sizes.